‘Tis the Season – for recalls, apparently. And even Old Saint Nick is not immune. As Santa’s sleigh is in for recall due to faulty reindeer harness fasteners, I wonder what he would choose as a backup ride to make his annual appointed rounds. Christmas Eve I will post my picks but I recently caught the fat jolly guy kicking some tires on a few new models. I began this annual ditty around the turn of the century and I find that I enjoy revisiting it each year as the world is buried neck-deep in the (commercial) spirit of the season. Looks like Santa’s load will be a bit heavier this year as early numbers indicate a bit more cheer in the air online and at the register. And the big guy will need to remember to bring along much needed accessories as wish lists are undoubtedly a bit tech-heavy this season. He was thinking about one of the new Jags, like perhaps the XJL, and anything with the green Land Rover badge on it always seems to make the short list but when Mrs. Claus heard the premier group is now owned by something called “Tata” she quickly put her prudish foot down. I understand the elves are having a blast up at the North Pole in their new Ford Fiestas that were given to them by Lee Dewyze after they found out the new VW Beetles they got from Oprah don’t even exist yet. Some earlier faves of Santa’s for this time of year included environmentalists’ favorite whipping boy HUMMER but I had to break it to the old guy that those vehicles were killed off by the current administration in D.C. faster than an elk at a Sarah Palin fundraiser. With fuel prices slowly creeping upwards again, Santa may wish to take advantage of an EcoBoost powertrain from Ford but he cannot get one in an F150 or an Explorer yet. 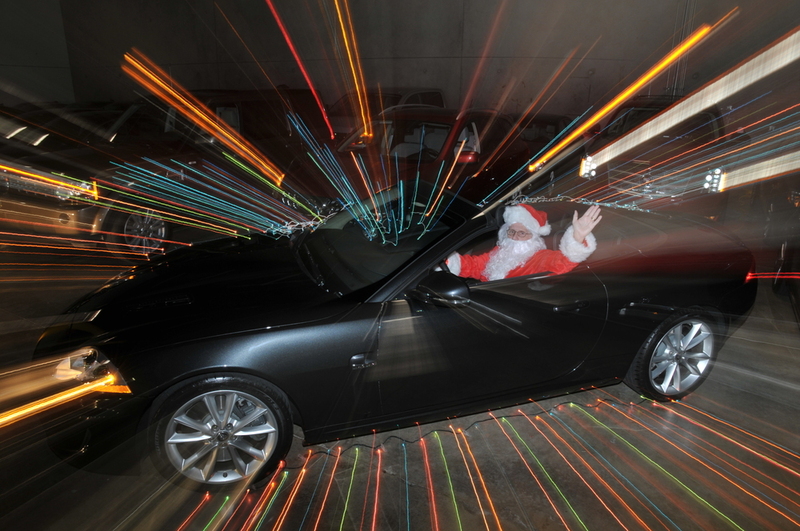 Note to automakers: Santa says every type vehicle stamped as a 2011 model needs to be available on Dec. 24. Period. If you are like me you may be hoping for gift cards (Home Depot) from the rosy-cheeked fella so these deliveries could be made in something sporty like a Chevy Camaro, Dodge Challenger or Ford Mustang (or the all-wheel drive Nissan GT-R) but anything with twin exhausts might wake the neighbors. Of course, given how many deliveries he has to make, a ZR-1 Corvette or Dodge Viper might be in order. The big guy tried out a few vehicles earlier this year. Some won his praise while others kinda let him down. He got stuck in the snow at the toy workshop in the Jaguar XJR and the 370Z Roadster and on his way home he took a shortcut in the F-150 Raptor and buried it in the mud. Some nice Jeep guys in Wrangler Unlimiteds helped him out though. The Caddy CTS-V would not start and the Acura ZDX and Honda CrossTour were a bit too funky for his more conservative tastes. He was impressed by the Suzuki Kizashi AND the Kia Sportage but felt a bit uncomfortable in the CTS Coupe and Sport Wagon. A long night of joyriding by the elves in the Chevy Cruze put Xbox360 Kinect production behind schedule and Rudolph was grounded after using Frosty and his buddies as an obstacle course for the Volvo S60 AWD. I heard that Santa did download a magazine app or two for his new iPad (no lump of coal for Steve Jobs – this year) and he read about a few vehicles that were being singled out as tops in their segments. The Ram 1500 pickup got a big trophy in Texas this year although rumor has it they would secretly trade it for Ford’s marketshare. The Chrysler Corporation was also honored on a national scale for the significant improvements made to the Jeep Grand Cherokee whilst the Chevrolet Silverado HD hauled home some magazine bling as top truck (from the same guys who gave them Car of the Year honors for Volt) and Santa read the Ford F-150 Raptor with the bigger motor got top nod from the Four Wheeler guys. So what would Santa drive this year? If the EcoBoost F-150 were available it would be his first choice. As it were he decided to hop in the loaded Jeep Grand Cherokee with the HEMI engine but only because Mrs. Claus had taken the Subaru Outback to drive down to Duncanville, Texas to see her granddaughters play in the Sandra Meadows Classic girls basketball tournament.